The illegal SAITM private medical school cannot be abolished his government would not abolish it said the Minister of Higher Education Lakshman Kiriella in Parliament today (7th). He said this in response to a question raised under Standing Orders 23/2 by the Chief Whip of the Opposition and Leader of the JVP Anura Dissanayaka drawing the attention of the Parliament to the uncertain state that has arisen among students due to repressive situation developing in universities. JVP Parliamentarians have on several occasions pointed out in Parliament that SAITM private medical school at Malabe has begun illegally as a BOI project by forwarding false information and it should be abolished. Sri Lanka Medical Council, doctors’ associations and students’ unions have on a number of occasions stated that SAITM is an illegal institution and had asked people not to get registered for its courses. Sri Lanka Medical Council published advertisements too stating it would not be responsible for those who register in the institution. While protests are being launched throughout the island demanding the government to abolish SAITM private medical school that sells medical degrees and in an environment where the government is mum on the subject, the private school at Malabe is taking measures to admit students for an ‘allied health diploma’ course say reports. The illegal degree shop has published advertisements in weekend newspapers to admit students for the courses. In a background where even government supporters such as Saman Ratnapriya, who had been an activist in trade unions in the health sector appearing for the degree shop, the educational section of the health sector too has come down to the level of privatization say political analysts. 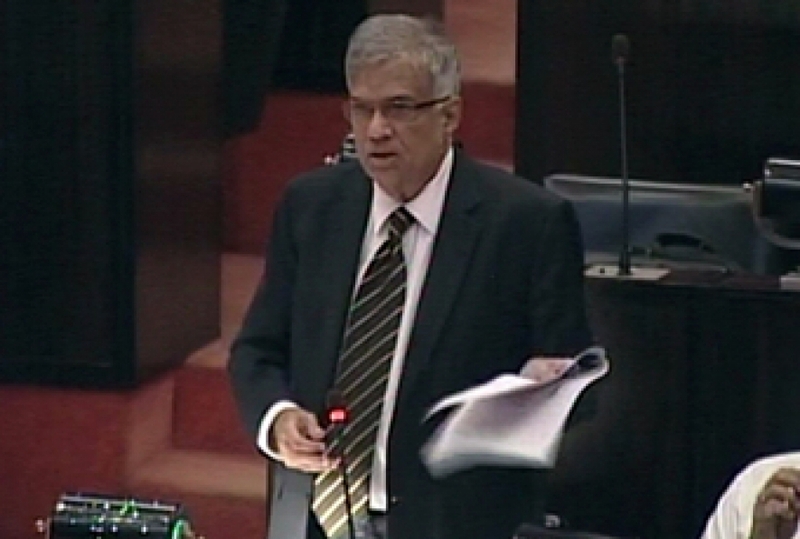 He wouldn’t make protecting former President Mahinda Rajapaksa an issue and he would be always concerned about Mr. Rajapaksa’s security said Prime Minister Ranil Wickremesinghe in Parliament yesterday (6th). Mr. Mahinda Rajapaksa engaging in politics is not an issue for him said eh Prime Minister. A large number of accusations that frauds and corruption were committed during Rajapaksa regime were aimed at Rajapaksa family and people in the country are aware that Mahinda Rajapaksa and Shiranthi Rajapaksa are left out of most of these investigations. There were also media reports that the Prime Minister and the President had come to an understanding that Mahinda Rajapaksa and Shiranthi Rajapaksa would not be arrested. He was arrested on charges of misusing a government vehicle attached to the Presidential Secretariat and obtaining fuel allowance from the Housing and Construction Ministry illegally. Investigations also revealed that Sarath Weerawansa, as the private secretary to his brother Minister Wimal Weerawansa, had used vehicle no. 65-1695 and KT-5335 until 08.01.2015. He had also used the vehicle having registered numbers HU-9099 in addition to the official vehicle he received as the private secretary. He had been given vehicle 300-6294 but had discarded it stating it was not usable. While he was the private secretary to the minister he had obtained Rs.637,741.93 as transport allowance and Rs.1,008,890.32 as fuel allowance stating he was using his private vehicle for official duties. “I suffered from a fractured leg for two years. I was told that Mr. Gotabhaya would be asked to get me a house. Rs.500,000 was deposited in my wife’s account. A house was given to us for one year’s rent. There was nothing after that. I don’t know what happened to the case.” This was what M.A. Harsha Pushpakumara, who was injured in the accident, said when he came to FCID to identify the car. The Ford Mustang car owned by Parliamentarian Namal Rajapaksa and later sold to another was involved in an accident at Baseline Road at Narahenpita on 1st May, 2014 while being driven without a number plate. The car was apprehended by the FCID on the 5th. Colombo High Court Judge Nissanka Bandula Karunaratna has noticed UPFA Mahinda faction Parliamentarian Udaya Gammanpila and Sydney Jayasinghe, the defendants in the case filed against them on charges of defrauding two foreign citizens of Rs.21 million using a fraudulent Power of Attorney to sell shares of a company belonging to the two foreigners to appear in High Court on 1st November. Meanwhile, Colombo High Court Judge Padmini N. Ranawaka Gunatilleka has noticed Parliamentarian to appear in Court on 3rd November on two charges including defrauding a sum of Rs.20 million.